Buckle up kids, this is gonna be a ride. So much of a ride, that we’ve broken this into two parts. We’ve already covered the name itself and the word mark. Now, in Part 2, we’re tackling the alternate and primary logos. 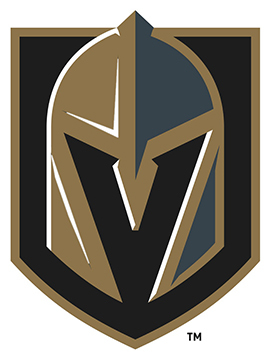 The first thought I had when I saw the alternate logo is that it looked like an icon straight out of an N64-era Legend of Zelda game. There’s both positive and negative aspects to that thought that are worth exploring. Positively, any 64-bit graphics have to be, by nature, simplified, because the medium can’t withstand overly complicated graphics in a meaningful way. That automatically gives it a more iconic aesthetic, which for a logo of any type, is usually extremely important and positive. Negatively, and just like any old video game, it looks dated. But not necessarily in a way that detracts from the inherently timeless nature of the it, but because you become aware of its incapabilities of the form. You just can’t Major(a)ly Mask it. Sixty-four-bit graphics looked amazing compared to 8-bit or 16-bit graphics, but once video games advanced past that, you could immediately see the limitations of the technology. 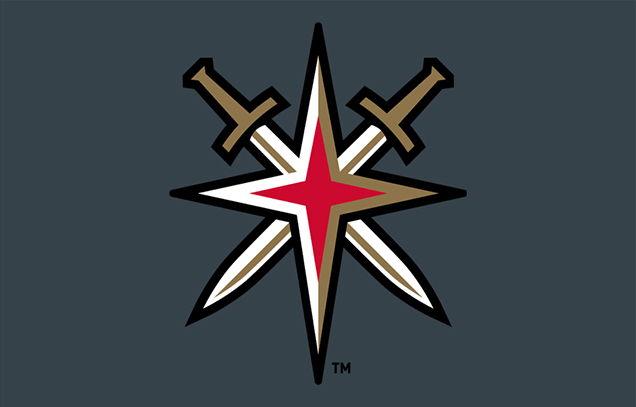 For the most part, the alternate logo manages to evade that negative part – except for one small detail that makes it look like dated 64-bit-esque technology…the end of the handle on the swords. The rest of the logo (especially the sword angles) have slight angles and curves to it that show a subtle elegance (and a technology beyond 64 bits), but the end of the handle looks haphazard, forced into that shape because pixels forced it to look like that. It’s the closest you’ll come to one small element taking down an entire logo. If I had an ocarina of time, I’d be inclined go back and warn them. And that is a really smart touch. 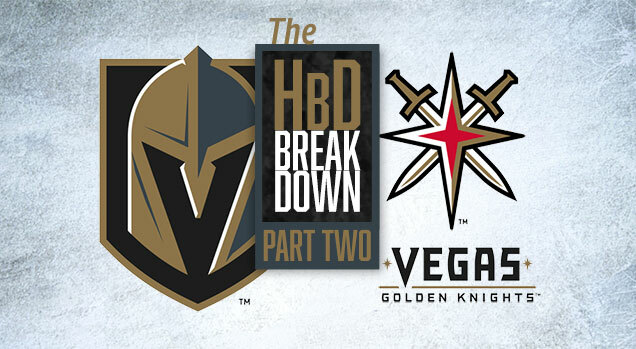 It’s an element that’s unique and distinctive to Las Vegas, and unique within NHL team branding as well. 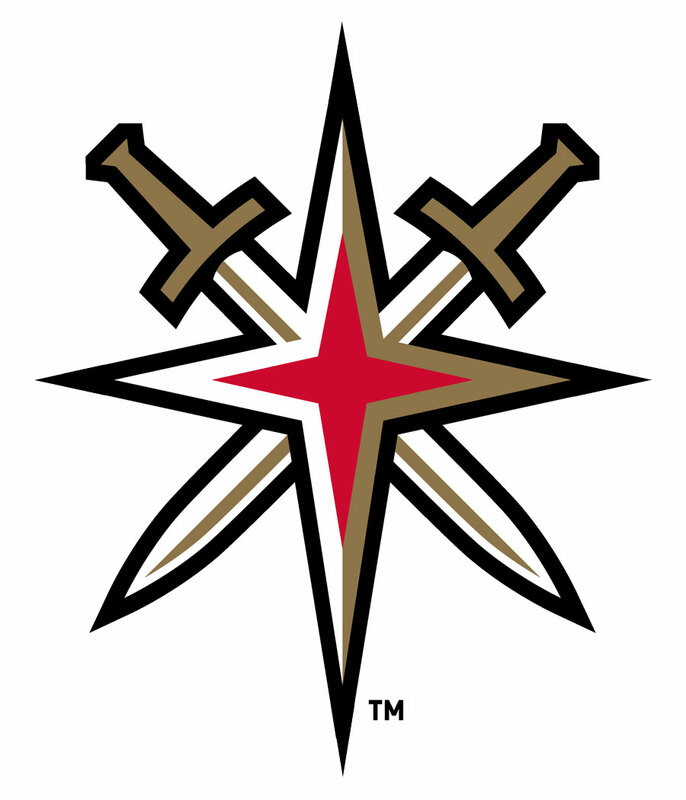 And the concept itself – having the crossing swords (representing Knights, of course) incorporated into the Vegas star – is fantastic. But the 64-bit issue mentioned above, as well as some other details (keep reading! ), bring it down. Aside from the star on the Las Vegas sign being red, the reason for having red in the logo is unclear. There is literally nothing else in what we’ve seen of the branding so far (primary logo, wordmark) that also incorporates red. They’ve stated that red is one of the colours including in the team’s branding, but with gold, steel blue and black already in there, the red is superfluous and unnecessary. That’s four colours, which is too many. 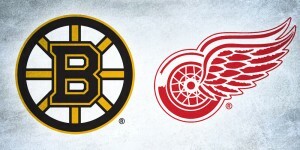 Look at Detroit, Toronto, Tampa – one single colour, and it’s built hugely successful logos/brands/jerseys. So many other teams just use two, to their benefit. Anything more, and things getting confusing and muddled. I know from sources that the inclusion of red was specifically requested by Bill Foley for this secondary logo. As well as on the jersey, so expect to see some red on there. I have no idea why he made that request, but this is the danger of giving non-designers too much influence in the design process. Let the experts do their thing. Using the exact same concept/design, you can easily switch out the red for a colour from the brand that’s not even on the alternate logo at all…the steel grey. Easy fix, but if you don’t like it, you need to go back and re-work that logo to make it work with a simpler colour scheme. Although there’s some criticism to be made about the uber-thick black outline around everything, but that bigger issue about the outline revolve around the points of the star. Everything else in the entire logo comes to a fine point. The swords, the handles, the inner-star points, the blade shadows, everything…except the outer-points of the star, which are blunted and rounded, and I don’t understand why the decision was made to do that. It’s true, at smaller sizes, it’s hard to tell the difference other than the logo extending a little bit farther, but when you see it at larger sizes, or close-up, it just doesn’t fit with the rest of the logo. And again, it’s an easy fix. 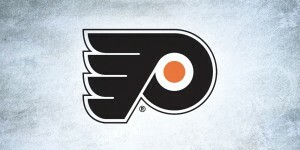 But the biggest issue with this alternate logo – it’s too stylistically detached from the rest of the brand elements. The thick black outline, the iconic illustration, the red – it all contributes to this secondary logo looking too different from the other visual elements: the primary logo and wordmark. It’s just a different illustration style, going for a slightly comic/video-game/illustrative aesthetic while the rest of the visual brand goes in a more refined and simplified direction. Already, the visual brand is being pulled in different directions, and any brand that tries to accommodate everything ends up meaning nothing. There’s always a process that influences the decision-making made while designing something like a brand (and decision-making that influences the process as well), so it’s difficult to know why they made the decisions they did. There’s potential in this logo for sure, but some of the stranger decisions – the inclusion of red, the non-pointed star – bring it down a few notches. And though it’s not the fault of anything of the specific design, it’s disconnect from the rest of the visual brand for the G’Knights just kills it. Finally, we’re at the main event…the primary logo that will grace the front of the jersey of all the players (presumably, because at this point, I wouldn’t put anything past this brand). 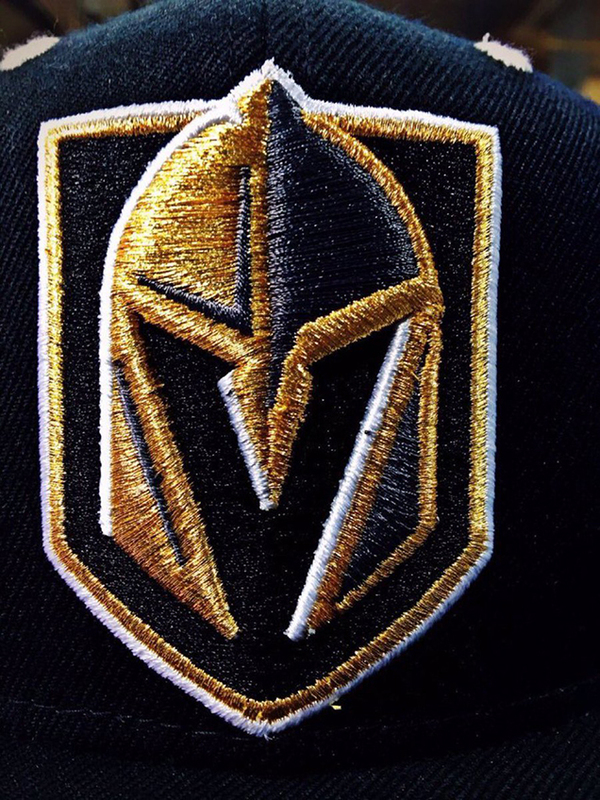 The first iteration of this logo that leaked out was embroidered on a hat. And my first reaction was a positive one – much more simplified and iconic than what could’ve been revealed, and the clever use of negative space to form a dynamic in the V. And that still holds when I look at it, as the nature of embroidery forcibly eliminates some of the details and inconsistencies within the logo, along with really great subtleties in texture and colour tones. That alone can mask a lot of foundational issues. The first foundational issue is the shadows and highlights, which don’t make a lot of sense the more you investigate them. We can assume that the white elements are highlights (or, areas which are getting the most light), and the steel grey elements are the shadows, all of which implies some depth and structure to the helmet. There has to be a little bit of leniency because you still need show the general concept of the logo. For example, the entire right side of the helmet should, technically, be in a steel-blue shadow, but that doesn’t make for a great logo and you’d lose all the structural detail on that side. But, on the left side of the helmet, there’s a white line running along the helmet’s entire edge (signalling that the “light” is coming from the left side), and then a shadow along the left cheek on the helmet. 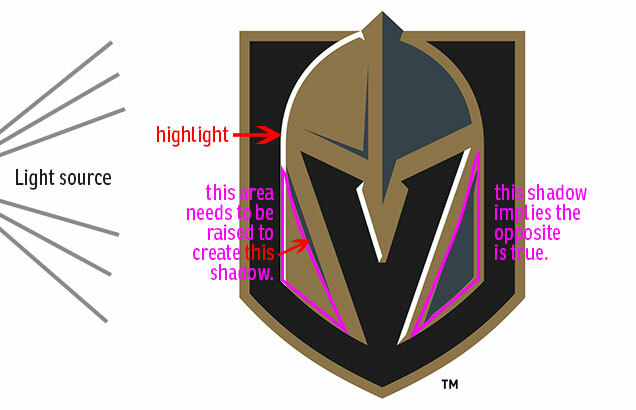 Structurally, that would mean that the bottom left part of the helmet is raised higher than the V-outline of the helmet to create that shadow, while the right side of the helmet (as well as the shape of the shadow itself) implies the exact opposite. Plus, the shape of the shadow implies the It’s a bit confusing to say, so here’s a quick and dirty diagram. The same is true of the top half of the helmet. The shadows on the left imply that the thick V-outline is inset compared to the rest of the helmet, and again, the right shows the opposite. So, how do you fix it while still showing the V-outline? You have to turn the shadows into highlights (and move them a little bit to keep the thickness of the V-outline consistent, as shown on the left. Do I particularly like this new look? No, not really. But at least it makes sense. Again, there’s definitely leniency in logo design for this sort of thing (like how plausible deniability is necessary to enjoy most movies), but these just don’t make any sense. There’s also the pointed shadow that comes down on the right side at the forehead, which doesn’t exist on the left side, making a non-symmetrical helmet. That’s not outside the realm of possibility, but it makes for an off-balanced design. And then there’s the pointed element at the top of the helmet which, because of the lack of any highlights/shadows defining its shape, appears to have no shape at all, just flatly emerging from the top of the head. Stylistically, it’s too different from the rest of the helmet. Everything else takes pains to add depth and structure (especially some really nice detailing in the vertex of the V), while this element has almost nothing. It’s a strange oversight. There are many examples in sports logos of elegant and interest shadows/highlighting. In the NHL, there’s the new Panthers logo and alternate logo, or the Coyotes logo. Or, in the NFL, the Broncos. And there’s tons more examples in the minor leagues, which gravitate more to animal/human logos. 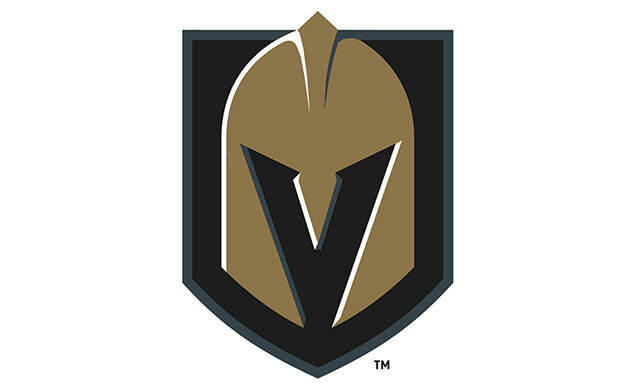 The Golden Knights are not a good example. I’ll say it – the shadows look like clip-art. There very little elegance to them. The two steel blue shadows on the left side are the worst culprits, taking away from any credibility and significance from the (at the very least) more interesting shadows on the right. I think I understand what they were going for – simplicity and an iconic aesthetic. Most of the iconic logos in the league have very minimal detailing, or at the very least, very flat detailing when compared to the afore-mentioned Panthers, for example. But, they still brought in too much while doing too little with it. They were trying to marry timeless and contemporary aesthetics – which is an extremely difficult thing to do and, unfortunately, it didn’t work out here. Solution? Veer towards simplicity. Drop most of the shadowing/highlighting altogether. Bring in a few that make more sense, and compliment what is the most interesting element in the entire logo: the large V. Everything else is just noise. For your consideration…a modified version of the logo that simplifies things a little bit. Keep in mind, this is 10-minute Photoshop solution with a concept that deserves more time and effort. Is it perfect? Not at all, but it’s better, and more in the direction it appears they were wanting to go. I know, by now, some of you may think I have it out for the G’Knights franchise, but I really don’t. 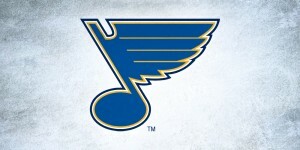 And I’ll prove it: I love the negative-space V in this logo. And if you’re going to drop the Las in Las Vegas, at least they used that to their advantage with this element. It’s interesting, unique, and dynamic, with a surprising amount of movement (helped, in this case, by the highlights used) to it. It fits with the general aesthetic of the rest of the concept and the symbolism of it is simple and recognizable. It’s an homage to the B and the C, further proof that they were hoping to create something more timeless than modern. Finally, there’s the shield. My first question was, is it necessary? No, at least not when it’s on a black background. On a white background, you definitely need the shield. Or, you have to re-work the entire logo so that it works on both a black and white background. Or, have two different versions of the logo for the different backgrounds. Or, you just have a solid-outlined shield that works on either. It’s simpler and easier, so it makes sense to include it. This brand is not off to a great start. 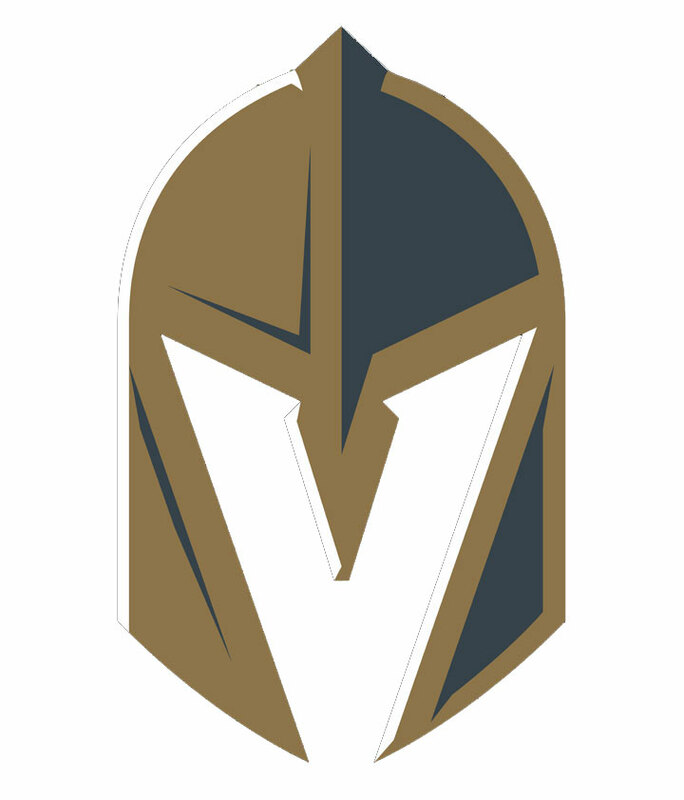 As mentioned in Part 1 of our G’Knights Breakdowns, the name and wordmark are not great. The secondary logo is okay, but inconsistent with the rest of the brand (so far) with issues of its own, and the primary logo doesn’t know whether it wants to be modern or timeless, settling on a place that is neither. The multitude of issues with the details in the logo is unfortunate, because the foundation of the logo (its primary concept) is solid. It just needs some more time and refinement to make it better. …A very thorough and fair critique. You’ve nailed the details. In general, the helmet seems a little too flat for a 3-D look, and a little too detailed for a 2-D style. It seems caught somewhere in the middle. 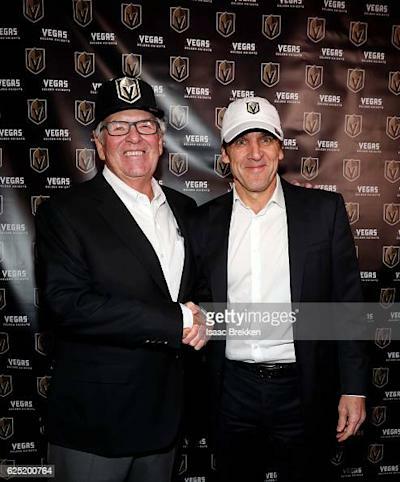 There’s been a lot of criticism from Las Vegans on the decision to drop the “Las” in the official team name. It’d be interesting to know if the decision to drop “Las” came before or after the “V” helmet was created. 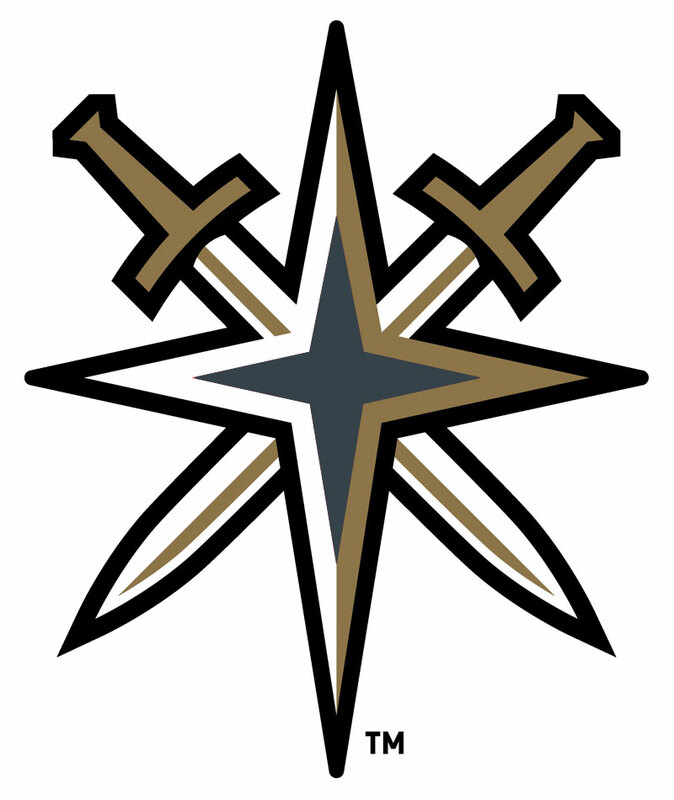 The Sword-Star is a great idea, as it’s the only piece that has a reference to Las Vegas. The late inclusion of red to the colour scheme is a little puzzling. 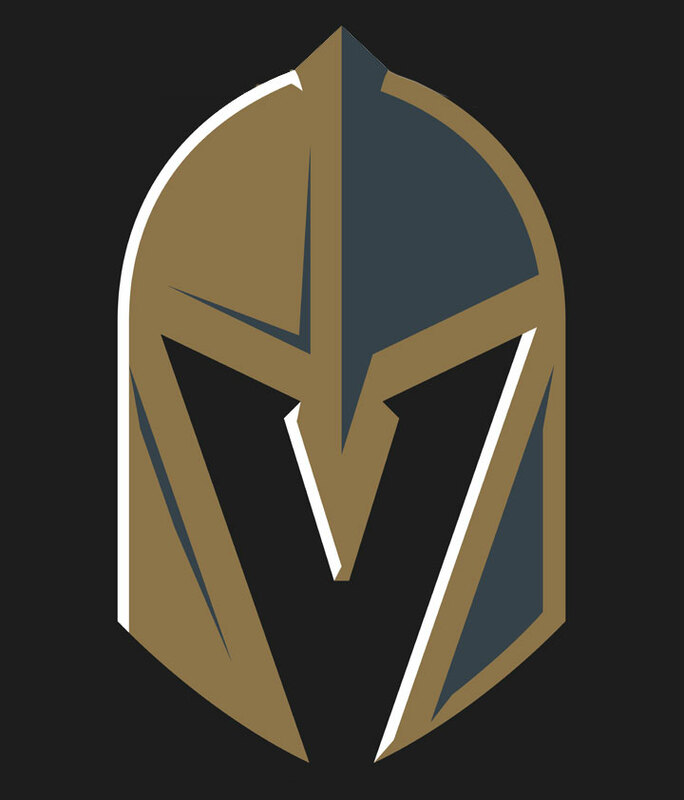 This comes a while after it was announced on the team’s website (VegasIsHockey) that the colours would be the Army colour scheme of gold, black and silver/grey. I’d say that 90% of the team merchandise that I’ve seen so far, doesn’t have any red in it at all. Where would you place the logo among the other 30 in the countdown? Great question! The BTLNHL list has to be updated, as there’s been some logo changes made, but I’d guess probably in the mid-20s somewhere. Still better than Kings, Ducks, Avs. But the Sens and Isles logos are better. It’s a solid concept, but the details and execution just absolutely kill it. I’ll be your devil’s advocate again, but just a few points this time. Regarding the points of the outline not being pointed. They would simply get too long and, well, pointy. You could bring them in or curve them a bit as they come to a point, but they still do get very long. Again, think of the logo as one that’s meant to go on black, then consider the outline as a base used for sewing it down. The round points also make it easier to keep a stitch running around the perimeter. Regarding the “shadows” that you’ve changed to highlights, while I understand where you’re coming from, you’re assuming that those are cast shadows, but I don’t think it’s that simple. You noted on the other side how it looks like the trim around the face is raised. I would consider those dark areas on the left side, then, to be dirt, grime, and patina that gets caught in the crevasse between two pieces of attached metal, and maybe a little shadow to define the raised trim as separate from the helmet shell. You really wouldn’t have a highlight in a recessed crevasse, so it doesn’t really work to just change the dark details to white. I think a better “correction” would be to leave the dark details as they are, then add white highlights next to them, on the raised trim itself. As usual, great points! I agree that the thick black outline changes the overall aesthetic of the secondary logo, and without that, it would be closer to the same aesthetic as the primary logo, but it still doesn’t quite feel the same to me. I can’t quite pin down why, but maybe it is the red…or those sword handles that are still driving me crazy. I think your suggestion for the shadows/highlights are great, and would like to see what that looked like. But, then it’s getting away from the simplicity that – I’m assuming – was desired. It’s a tough balance to achieve, for sure.